Monster movies. People just love monster movies. Back in the 30s, the monsters were mostly human in appearance, with Dracula and The Mummy setting the stage for what came after. The 50s saw the type of monsters growing into the more surreal, with The Creature From The Black Lagoon, Them! and It Came From Beneath the Sea just to name a few. A lot of these films relied on models and rubber suits, and most of the memorable ones involved Ray Harryhausen. As special effects techniques progressed, the monsters became more complex, like Geiger’s xenomorph from 1979’s Alien. While the 80s were more concerned about action flicks with big manly stars, one film from the decade not only brought back the monster movie but had a bit of fun at other action flicks’ expense. It’s called Predator and is, among other things, a movie about a monster FROM SPACE! Arnold Schwarzenegger, long before his ascent to governor of California, is ‘Dutch,’ the leader of an elite “rescue squad” sent into a South American jungle to rescue a cabinet minister. His team is accompanied by his former squadmate and current CIA operative Dillion, played by the equally manly Carl Weathers. Along the way to the enemy encampment they find a lost team of Dillion’s that had been brutally, almost ritualistically murdered and skinned. They find the enemy camp and blow it to smithereens, which to my mind makes it difficult to ensure a successful rescue, and find out the mission was a set-up. 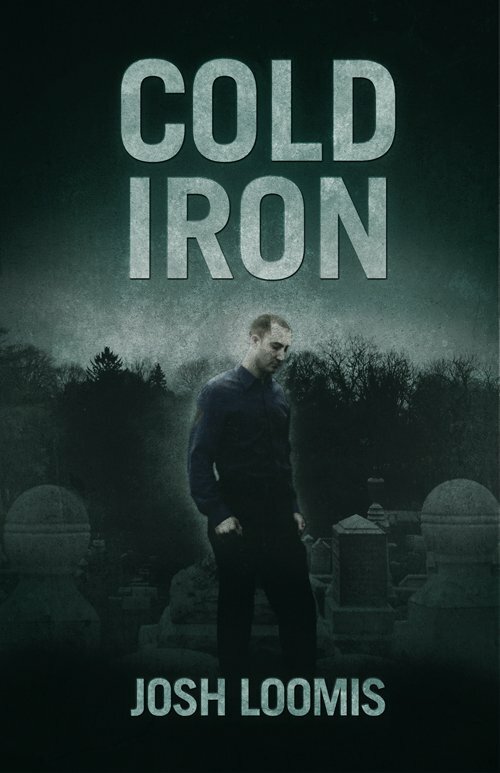 On their way back, though, the members of the team start dropping dead one at a time, and it turns out that these professional hunters are themselves being hunted by a single, alien being with advanced technology, a high level of cunning and an undying love for the hunt – the eponymous Predator. One of the things Predator has going for it is relative simplicity. It moves from action movie to horror to science-fiction monster fight pretty smoothly, and doesn’t waste time with extraneous plot or elaborate character development. I’d be lying if I said the film was well-written, though. The lines were clichéd twenty years ago and are even more so now, and they’re delivered with such machismo-fueled ham-handedness that you can almost smell the bacon sizzling. Jesse Ventura (hey, another governor!) and Sonny Landham are particularly guilty of chewing the scenery in this flick. Some of the best moments in the movie come when nothing’s being said at all, and we read the characters’ expressions rather than hear them rattle off another self-congratulatory one-liner, which for Arnold is par for the course. When Predator was being made, studio execs clearly were viewing the success of The Terminator, Platoon, and Aliens with envious eyes. They wanted another big loud macho gun-heavy action flick, and asked director John McTiernan for exactly that. His reaction is well-documented, as he crafted a five minute scene of the cast doing nothing but shooting guns at practically nothing. He got the impression that the producers’ and audience’s fascination with guns bordered on the pornographic, and so delivered this more than slightly sexualized depiction of large, well-toned men unloading their weapons in a swelteringly hot environment. The fact that they hit nothing at all underscores the impotence of such diversionary film-making, and about the only thing that survives the masculine ejaculatory fusillade is the lampshade McTiernan hung on the whole idea. All of that talk of hot man-love segues me neatly into the next glaring thing I see about this film that had me laughing the whole time I was watching it. There’s a huge undercurrent of homo-eroticism that is pretty hilarious even if it’s unintentional. You have several large men in an intimate situation often shown slapping hands, shooting guns and showing an odd amount of concern for one another, with long looks exchanged between each other as sweat slides down their skin. Considering this is meant to be a manly movie, the sort of flick that would arm-wrestle 300 in the back room at a bar (which may or may not be lit by candles), and “perfectly straight” guys are meant to be whooping and hollering at the screen, it wouldn’t surprise me if a lot of this film’s devoted fan-base either indulge in the sort of self-denying homophobic ‘humor’ that typifies most random Xbox Live people I’ve encountered, or want to protect the institution of marriage from those ‘insidious’ gays. And I also wouldn’t be surprised if they were too dumb to notice. 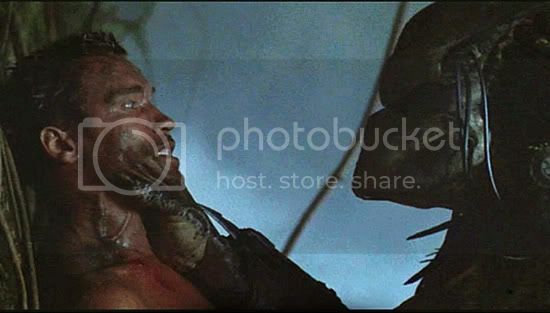 Looks to me like the Predator’s wondering what Dutch uses to exfoliate. 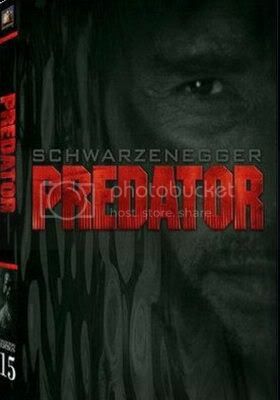 Despite the nits I’ve picked about this flick, it doesn’t detract from the fact that as a monster movie, Predator does the job. The creature, a towering and truly alien hunter, is effective and exists as another example of Stan Winston’s genius, may he rest in peace. The slow reveal of the predator’s methods and technology build tension and suspense, and the final confrontation between it and Arnold do make for some decent action. It’s a shame that the suspense is undercut by lousy line-reading, but the gradual and unhurried pace of the build-up towards the end still persists as an example of relatively good story-telling in a genre that usually looks at story as a vestigial growth meant to string the audience along from one gunfight to the next. Predator isn’t a bad movie, by any stretch of the word. It’s just so unintentionally hilarious, especially in retrospect. As much as the special effects hold up despite its age, the writing and implications of certain scenes are just raucous in comparison. What’s telling to me is that McTiernan went on after this to direct Die Hard which is not only one of my favorite action films of all time but is also what I’d call a ‘thinking man’s’ action flick. Predator by comparison doesn’t require much thought at all, but it’s still diverting and plenty of fun. 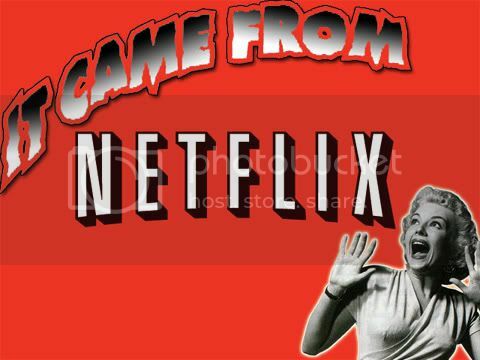 It’s good to have on your Netflix queue if you have a summer weekend coming up and are looking for something to watch on a lazy sunny afternoon. From a guy’s perspective, it’s definitely best enjoyed with other guys, preferably in a dark basement with a cool beer at hand while you watch large, well-toned men unload their hot barrels. 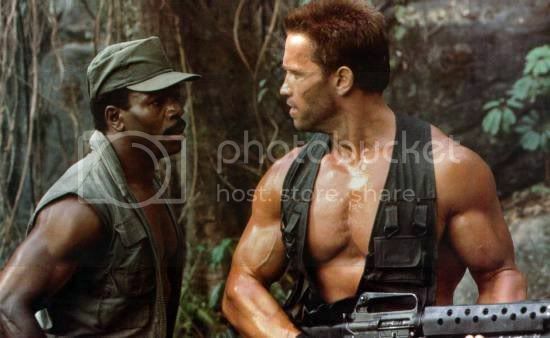 Predator is one of the greatest movies to come out of the 80s, and the 80s were the Golden Age of action. If that means I have to hump the Governator in order to enjoy some hot commando-on-alien action, so be it!